Bono - "I couldn't be more proud"
The British Ambassador to Ireland David Reddaway has conferred an honorary knighthood on U2 singer Bono in recognition of his services to the music industry and for his humanitarian work. He said that the award recognised Bono's extraordinary and inspirational commitment to relieve global poverty. "He has played a key role in persuading governments and international institutions to wipe out much of the burden of international debt owed by Third World governments. We in the UK particularly appreciated his work alongside our G8 and EU Presidencies in 2005, which we were determined would produce real benefits for Africa," said the Ambassador. He also highlighted U2's effectiveness in raising support for justice-related causes. In accepting the insignia, Bono said: "What a great year for an Irishman to receive an award from Great Britain." He continued: "The peace process has proceeded to a conclusion, debt cancellation - started in Great Britain - has put 20 million African children in school. The Happy Mondays and Shaun Ryder have reformed. England's rugby squad entered Croke Park to thunderous applause, silence for 'God Save the Queen', then the Irish hammered them." He added: "I couldn't be more proud. I would like to thank Her Majesty's Ambassador for pinning this award on me in my home town, and the band for not bursting my balloon." Bono is now a Knight Commander of the Most Excellent Order of the British Empire, or KBE. As he is an Irish citizen, he will not be able to use the title 'Sir'. 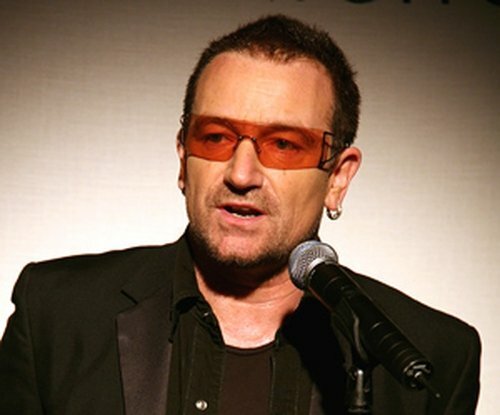 In 2003, Bono was presented with France's Légion d'Honneur by President Jacques Chirac, while in 2005 he was voted Time magazine's Person of the Year for his work promoting justice and equality, along with Bill and Melinda Gates. In 2006 he was named the most influential pop star of the past 25 years by MTV.